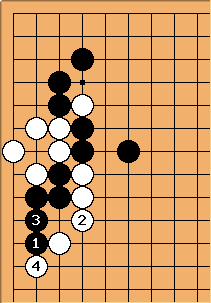 Normally in the 3-4 point high approach inside contact joseki, White continues at a or b, and both extend. 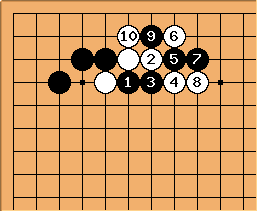 However, it is also not uncommon in professional play for White to play to here, then play tenuki. 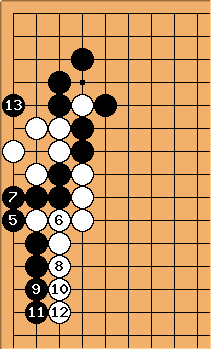 Most usually, White will play in the upper right, trying to settle things there first before returning to this corner. 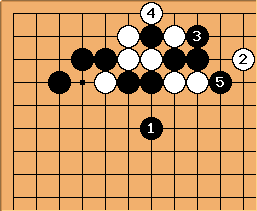 If White is the next to play here, the joseki of course continues the normal way. For Black, cutting at is now normal. 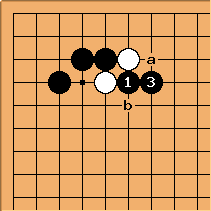 With the continuation to , Black builds thickness while white makes a base. If the upper right is White's, might be at a or b instead. 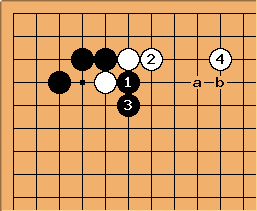 Black can also play , white then plays atari with in order to push out at in a forcing and effective way. 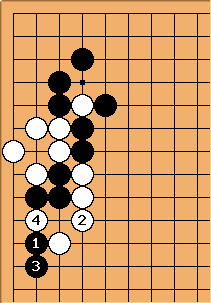 This variation gives black an even stronger position on the left, so if that is important is recommended. Watch out however, white will be very strong to the right. Charles Once played by Go Seigen, in 1971; not joseki, I guess. Although and in the previous diagrams is by far the most common answer, Black also has the more aggressive move at available. With , White accepts the invitation to fight. The continuation can easily get hectic. 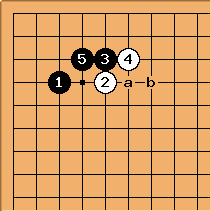 If White wants to avoid complications, she can play here, or a; which is similar. A second way for White to avoid the complications in the previous diagrams is by giving atari at first. 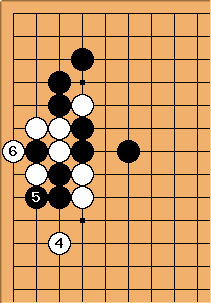 After , Black can build up thickness at a or b, or take sente to play elsewhere. 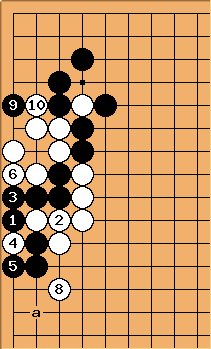 Not uncommonly, White plays tenuki yet again after . Black can finish the shape with here, or at a or b. After that, this corner is played out. 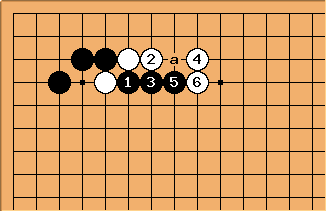 Black has a lot of influence, while White has only little aji left, but such a result is to be expected given that Black has played three stones more than White. What is not mentioned at DoubleThreatLadderMaker is the chance of playing as kikashi: after White doesn't have an immediate way to capture the two stones. 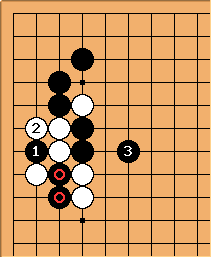 PeterHB: In that game, Kong Jie, who has the situation demonstrated with Black here, manages to live. 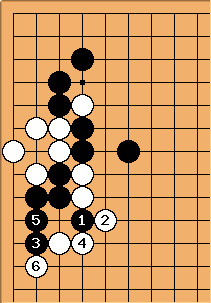 This is confusing to me, as I assumed the point was for Black to die, though in the referenced game Ma Xiaochun does seem to benefit from the consequential thickness gained. I haven't understood this. 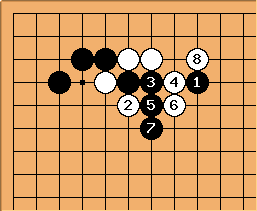 However, if Black has no support on the lower side, then is a tesuji which seals Black in. 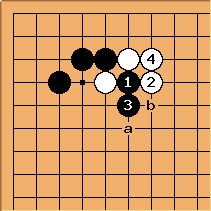 After , it becomes difficult to move the three Black stones. If attaches underneath, then and does the job. If first before , then does the trick. In the text accompanying Ishida Vol. 2 p21, Dia. 53, is suggested. PeterHB: This is my guess of the implied continuation. Black seems to live, which I don't think is what the the text implied. Ishida doesn't give the continuation, so I don't know if this is what was meant. Perhaps someone else could comment. anonymous: B may be able to eventually crawl to safety by jumping to 'a', but after b, c, d, e, f the situation is the same, while giving W an even more glorious wall. 7@4; Is this enough thickness to compensate? PeterHB: seems the key move to pay attention to. With , it seems Black kills without giving away too much. Is this a 'thickness judgement' issue, where I as a kyu player see it one way, and Dan players see it another, as too much thickness? : W responds to 9 at 10. W group has 4 effective libs, B group has 3.